Battle: Los Angeles is a Film programme that first aired in 2011 and has been classified a 12 certificate. 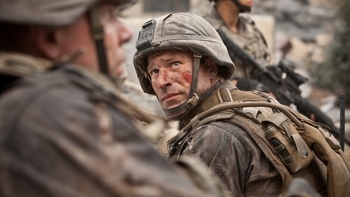 Haunted by the loss of his platoon during combat in Iraq, Staff Sergeant Michael Nantz (Aaron Eckhart) is all set to leave the US Marines when alarming reports start coming in from around the world. What initially seemed to be an international rash of meteorite showers soon transpires to be the opening stages of an alien invasion. Based at Camp Pendleton, Nantz is ordered to accompany a platoon under the command of Second Lieutenant William Martinez (Ramon Rodriguez) to Los Angeles, where an alien army is emerging from the sea and laying waste to the population. On the ground, the Marines quickly realise that they are outnumbered and outgunned, and, as the casualties mount, it falls on Nantz's shoulders to lead the squad in a desperate counter-attack. Battle LA may be derivative but it's also a hell of a lot of fun. Taking the shaky-cam combat of Black Hawk Down, aliens and patriotic posturing from Independence Day, and topping it all off with some District 9 style used-universe scuzziness, Jonathan Liebesman has created a highly enjoyable (if rather familiar) sci-fi adventure. 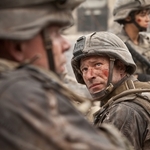 Aaron Eckhart delivers the requisite clenched-jaw theatrics with aplomb, keeping the proceedings stoic and stirring, even when all the flag-waving gets a little silly. There's able support from his team as well, particularly Michelle Rodriguez who seems to have cornered the market in playing hard-bitten military lasses. The real star of Battle: LA is, perhaps inevitably, the special effects, with the City of Angels receiving a visually satisfying pounding from the squid-like invaders and their clunky spaceships. There may not be an original idea on display, but what it lacks in innovation, Battle LA compensates for in unbridled carnage and rousing heroics. When is Battle: Los Angeles next on TV?